Dry Creek turquoise is also referred to as Godber-Burnham stones because this mine is located in Dry Creek of Austin, Nevada. It was Joe Potts, and Bob Burton who had discovered the mines back in 1932 and it had been known by names such as the �Last Chance,� �Blue Stone,� �Homesite,� and �Dry Creek.� The mine was later on sold to Frank Burnham, and then Walter Godber. 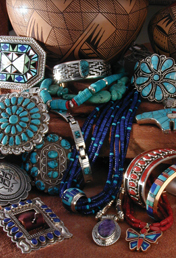 Turquoise pieces mined from this area have colors which range from medium up to dark blue and sometimes have beautiful spider web patterns. This kind is also known for the black or very dark mottling it has which forms blotches as well as veins visible on the stone. Turquoise from this area is considered as one of the high-quality pieces and from Oscar Branson�s book called �Turquoise� it was stated that Dry Creek turquoise pieces are �so hard and compact� and that these are also some of the all-time finest turquoise pieces which originate from Nevada.